Want a great way to encourage others to get back to the Bible? How about a FAST T-shirt. Has a great message on the back and our logo on the front. Made with 100% cotton, and comes in small medium and large sizes. 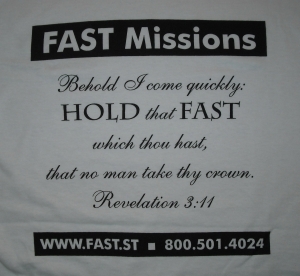 Thanks for helping to spread the word about FAST!